How did a sleepy alpine community become one of the most popular tourist destinations in the Alps? 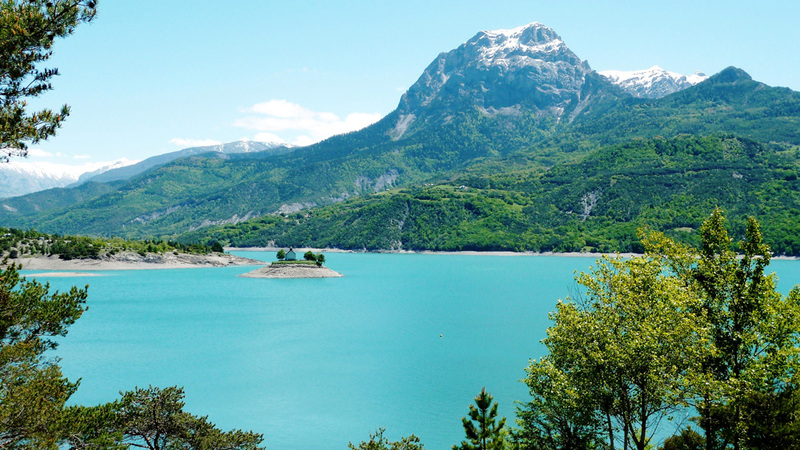 Read on to discover the history behind the creation of the lake at Serre Ponçon... 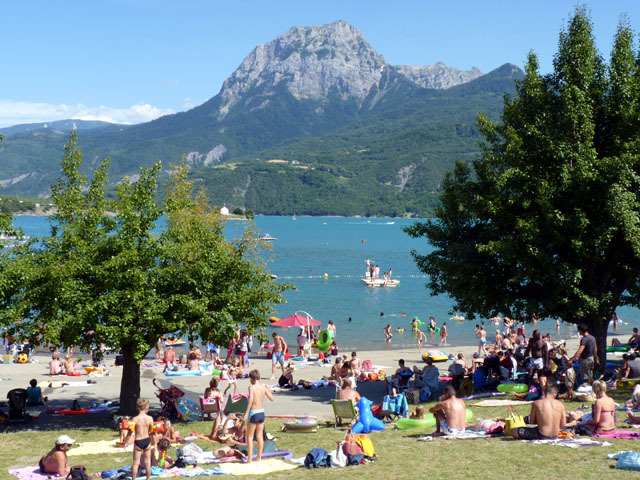 Situated in the heart of the Hautes-Alps, the lake of Serre Ponçon has become a top destination for holiday-makers and water sport enthusiasts. With its beautiful turquoise waters, 80km of shoreline, natural creeks and coves, the Provençal climate, mountain backdrop and range of activities, it’s easy to see why Serre Ponçon is thought of as small paradise by locals and tourists alike! Yet less than a century ago, this stunning lake and all the attractions that accompany it did not even exist! After you’ve navigated its waters or sunned yourself on its beaches, take the time to discover the cultural and historical past of the lake – a history as rich and deep as the colour of its waters! The lake of Serre Ponçon is one of the largest artificial lakes in Western Europe; ranking 3rd in terms of size, and 2nd in terms of capacity. 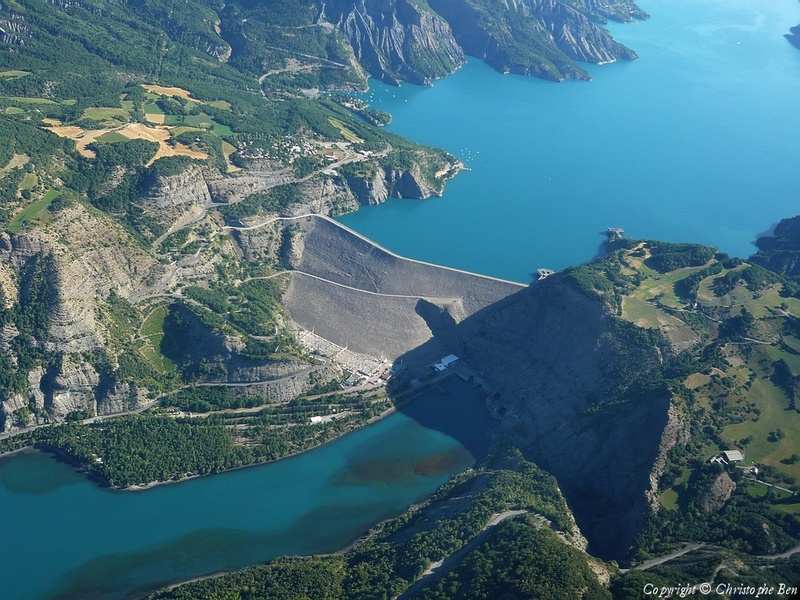 The lake which is situated in the southern French Alps was created by damming of the Durance river, 2 km downstream of its confluence with the Ubaye river, by a 123 m high and 650 m wide earth core dam and holds over 1.2 billion m3 of water. As well as water control, 16 hydroelectric plants use the water and the lake provides irrigation to 1500 km² of land, as well as providing a reserve of water in the battle against forest fires. In 1843 and 1856, catastrophic damage and loss of life was caused by the flooding of the Durance and led to questions being raised as to the feasibility of a dam being built. First proposed in 1895, construction started in 1955 and was completed by 1961. The dam was constructed and the valley slowly became a lake. Approximately 1500 people had to be relocated when the villages of Savines, Ubaye and Rousset were flooded for the new lake. The village of Savines was rebuilt and became Savines-le-Lac, inaugurated in 1962. This huge public works scheme was to transform the economy of the region. The initial obstacles were numerous; and surveys recognised it was not possible to construct a dam in concrete as the rock foundations were drowned under 110m of alluvial soil. At the start, the dam was built to make electricity as, after WW2, the need for electrical energy grew significantly. It was also developed as a way to provide water for the regions agriculture and as a way to tame the devastating effects of the Durance. In 1912, the inventor Ivan Wilhem, published a report demonstrating the necessity of taming the course of the river. Furthermore, a dam would create an enormous reserve of water for agriculture. In 1948, after 25 years of work, Wilhem proposed a plan which seemed feasible. It was therefore decided to build an earth dam inspired by American techniques as this type of construction more readily accepts deformations in the event of an earthquake. Located in a seismic zone, the dam is supposed to resist a shock measuring 7 on the Richter scale. Work to build Serre Ponçon started in 1955 and took 54 months. Many problems, both human and technical were encountered, but it is now recognised that the dam has significantly contributed to the economic and tourist development of the region. 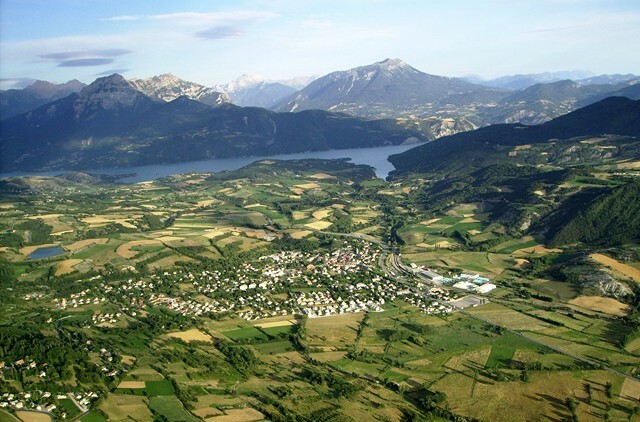 The varied cultural, historical and economical history of the Serre Ponçon area can also be seen in the numerous alpine villages that surround the lakes shores. Each village has its own history and heritage. From the modern village of Savines-le-Lac, constructed in the 1960’s to re-locate those displaced by the creation of the dam to the village of Chorges, ancient capital of the Caturiges, a celtic Alpine tribe and which became, and has remained, a key crossroads for crossing the Alps since antiquity. The architectural heritage of this area is also marked heavily by its religious past, from multiple hamlets of protected chapels and churches to the 12th century Cathedral of Embrum – one of the most important monuments in the French Alps and the beautiful, recently restored Abbey of Boscodon. Another notable sight in the region, and one of the most photographed, is the Chapel of St. Michel. Built on a small knoll in the 12th century, this chapel was associated with the abbey of St Michael de la Cluse and was destroyed by the army of the Duke of Savoie in 1692. Rebuilt at the end of the 17th century, the chapel became a site of pilgrimmage for the parishionners of Chorges and Prunières for the festival of saint Michel. With the completion of the dam in 1961, the chapel was condemned to be destroyed. Luckily, as it was deduced that the chapel lay at an altitude slightly superior to that of the future lake, it was finally conserved. Today, the chapel has been walled and stands alone on a small island a few metres above the water level. At Undiscovered Mountains, we work in partnership with a range of activity providers based on and around the shores of Serre Ponçon are pleased to offer you a range of water and land based activities as part of our summer multi activity holiday including windsurfing, kayaking, waterskiing, wake boarding and stand up paddle. If you would like any more information about any of these activities or the Serre Ponçon area and things to see and do, please contact us.